This was my first house. It was in Brooklyn. It was built in the late 1960s and it needed some fixing up when we bought it. I put a lot of work into this house and I had a lot of fun doing it. Changing the windows was like icing on the cake. Around the time I did this in the mid 1980s, Anderson, Pella, and Marvin were the big 3 windows companies out there. I decided to choose Anderson windows because they had wooden frames so they don't conduct the cold like a metal frame window. Also their product line was modular. 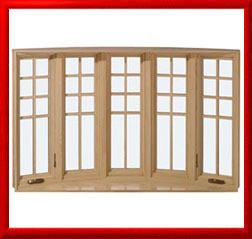 You could pick out standard Window units and then join them together with custom mullion posts to configure them as a bay, or bow window. Which is what I did above. However because these windows were big and heavy I hired an Anderson certified contractor to install them. I installed the storm doors, refinished the front doors and added the outdoor lights on myself.